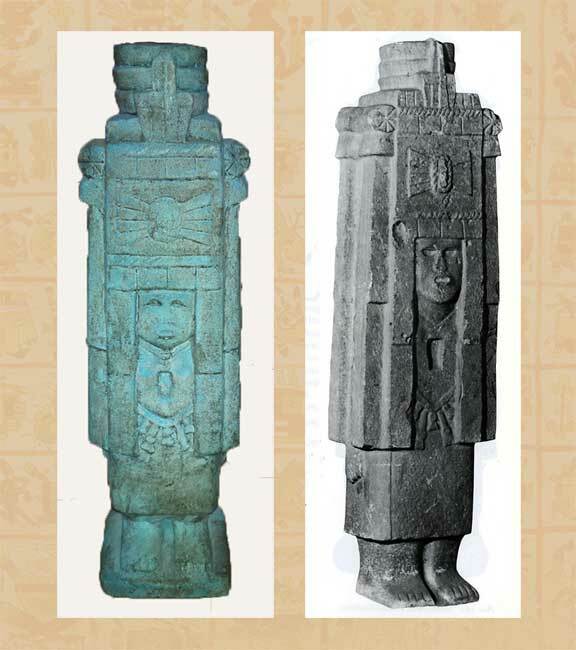 This is clearly a fine copy of a stone statue of a maize goddess - we’ve included a photo above from Aztec Art by Esther Pasztory - the original is 1.47m high, comes from Veracruz, and is housed in the National Museum of Anthropology in Mexico City. Pasztory adds ‘This goddess is usually standing, her face framed by a headdress almost as big as she is. Its rectangular panels resemble a temple front, the goddess looking through a doorlike opening... The Goddess with Temple Headdress is a maize diety, often holding double ears of corn in her hands... The cult of this goddess and the type of statue associated with it may have come from the east, perhaps from the Huastec region, where statues of standing deities in that style were erected before the Aztec period. The most beautifully carved Temple Headdress goddess are from the site of Castillo de Teayo on the coast of Veracruz’ - ie yours! We think it’s highly unlikely to be original, but one just never knows! Do you not have any clues as to its provenance (who owned it before)...?